Blaine Wetzel got his start at a very young age. By the time he returned to his native Washington at the age of 24 to head the kitchen at Willows Inn on Lummi Island, he had spent eight years cooking around the world. He had cooked in the kitchens of Mary Elaine’s at the Phoenician in Phoenix, Alex at the Wynn in Las Vegas, Aubergine at l’Auberge Carmel in Carmel-by-the-Sea, and Noma in Copenhagen. His cooking at Willows Inn has turned heads, earning his far-flung archipelago off the coast of the Pacific Northwest some time in the culinary spotlight. In 2012, he was named one of Food + Wine Magazine’s Best New Chefs, and earlier this year, he was elected the restaurant industry’s “Rising Star” by the James Beard Foundation. Although Wetzel had been on my radar for a couple of years, I didn’t make it to Willows Inn until last year. I liked it so much that I went back for a second time a few months later. Using ingredients he finds locally, Wetzel subscribes to the foraging branch of the Nordic school of cooking. 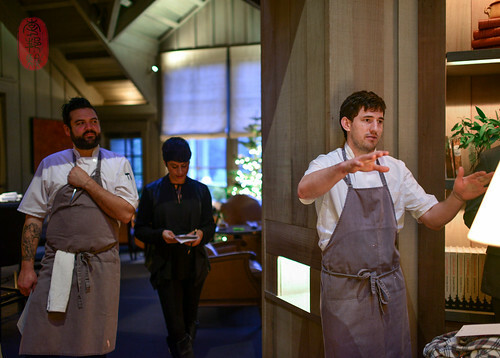 I was particularly interested to see how he would he bring a sense of place to his dishes at The Restaurant at Meadowood, where he cooked the fifth night of the Twelve Days of Christmas, with wine pairings by Failla. Inspired by the ingredients he found in Christopher Kostow’s kitchen, and eager to use as many products as he could, Wetzel’s menu for his dinner at the Twelve Days of Christmas quickly ballooned to ten courses. Together with three courses from the team at The Restaurant at Meadowood, this was the longest menu at this year’s Twelve Days of Christmas so far. Wetzel presented some of the most simple and delicious food I’ve had at this year’s dinner series. His dishes were all very simple, each showcasing the flavor of one or two ingredients. Among my favorites was a single prawn, served with its roe and bit of its own broth and oil. There was also a truly delicious bowl of steamed yellow foot mushrooms, also served with just a bit of its own juices. Wetzel found an untended field of wild wheat on Lummi Island. 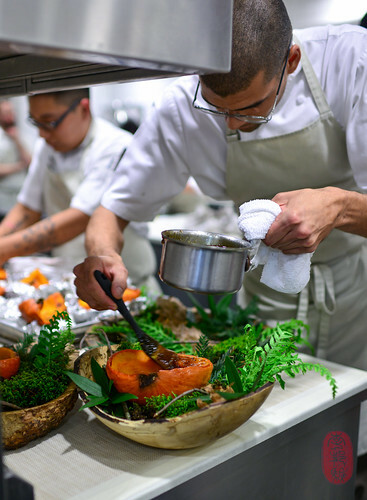 He gathered the kernels, sprouted the wheat, and brought them to The Restaurant at Meadowood, where he cooked them and served them in the cooking broth, still warm and steaming. That was immensely comforting. So was a tea that he made by steeping young birch branches from his backyard in hot water. The tea had a mellow, sweet fragrance that reminded me of Chinese red date soup. One of my favorite courses at this dinner was Christopher Kostow’s Alpine cheese course. He melted the hard, aged cheese down with some dairy, and served it as a rich, thick pudding. Paired with the cheese was roasted red curry pumpkin, which was glazed with honey flecked with black truffles. The pumpkin was presented table-side, and then spooned out of its skin, still steaming, over the cheese. Below, you’ll find the menu from the fifth night of the Twelve Days of Christmas with Blaine Wetzel of Willows Inn and wines by Failla. You’ll also find a slideshow of all of the photos that I took. Black sesame, pickled plum, shiso. Smoked cod cheeks, crispy cod skin. Served in its own cooking juices.